The classic, completely a-historical, over-the-top Tony Curtis, Kirk Douglas, Ernest Borgnine adventure film from 1958 is up on YouTube. 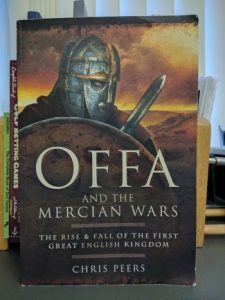 In Offa and The Mercian Wars, Chris Peers offers an intriguing look at the powerful Dark Ages Kingdom of Mercia. Beginning around 600 AD in the central part of the island and continuing for nearly three hundred years, Mercia grew to be the region’s superpower. At its peak, Offa’s Mercian Kingdom encompassed most of southern England, including East Anglia, Essex, Kent, Sussex and Wessex. Author Chris Peers is well known in miniature wargaming circles, both for his historical writing, and for his gaming rules sets and sourcebooks. Peers’ work in Offa is largely drawn from primary sources such as the Anglo Saxon Chronicles, Bede’s History of the English Church, Malmesbury’s Chronicles of the Kings of England; and from archaeological evidence. I was surprised and pleased at how much Peers was able to reconstruct of this Dark Ages kingdom and of its greatest ruler, Offa. Fragmentary and sometimes contradictory or biased accounts are supplemented with archaeology and a good dose of common sense. For example, Peers offers the story of Aethelberht the Martyr, as recounted by one Osbert of Clare. Aethelberht, it seems, was the religious young King of East Anglia, who went on a mission to ask for the hand of Offa’s daughter. While in Merica, he is seized, and beheaded ostensibly at Offa’s order under the urging of Queen Cynefrith. Aethelberht was supposed to have been plotting an invasion, not a wooing. The young pious King’s body, thrown into the River Lugg, is naturally later associated with various miracles. The excerpt above also illustrates, I think, the difficulty of obtaining large amounts of irrefutable evidence from the “Dark Ages.” They’re called that for a reason. 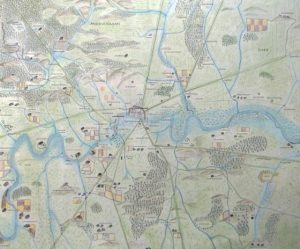 To his reconstruction of the history of the Kingdom of Mercia, Peers adds information on geography; military strategy, tactics and equipment; religion and other background. All of this helped to put the story of Mercia into context. Offa and the Mercian Wars:The Rise and Fall of the First Great English Kingdom is worthy of a read by folk interested in the Dark Ages period. I enjoyed it a lot, and as usual, after reading such a book, I’m ready to go out and buy some Mercian miniatures. 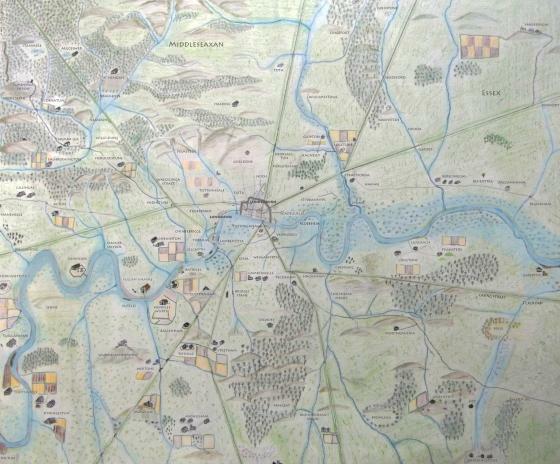 Dark Ages gamers may be interested in this map of Anglo Saxon London. A very large and usable image of the map is at the link. from the BBC. I love the Dark Ages as a gaming period.